Get back on top of your messaging. Franz is your messaging app for WhatsApp, Facebook Messenger, Slack, Telegram and many many more. Franz is the former Emperor of Austria - but also a messaging app that combines chat & messaging services into one application. 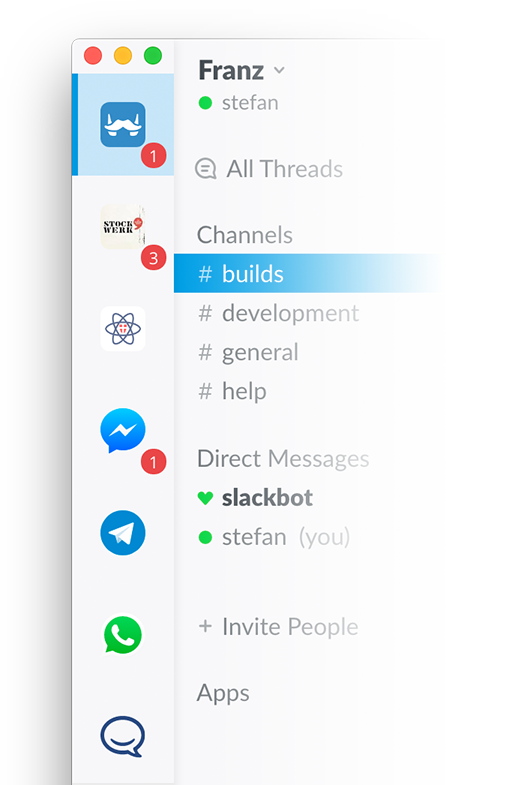 Franz currently supports Slack, WhatsApp, WeChat, Facebook Messenger, Telegram, Google Hangouts, GroupMe, Skype and many more. 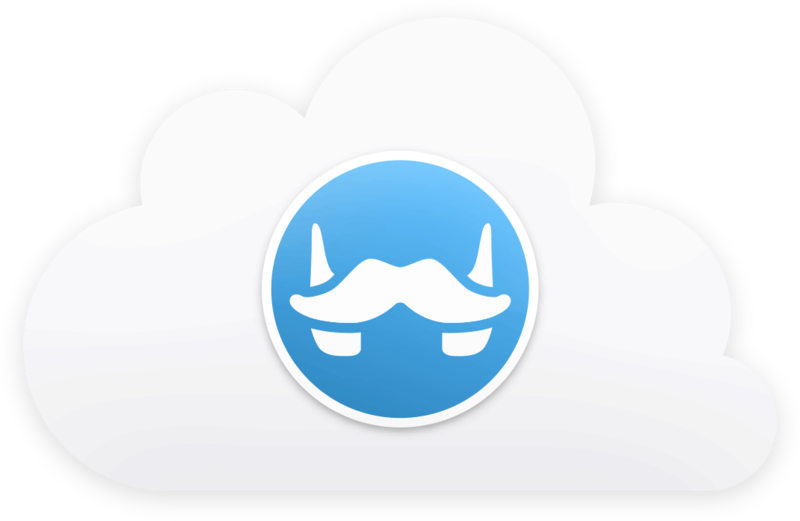 You can download Franz for free for Mac & Windows. 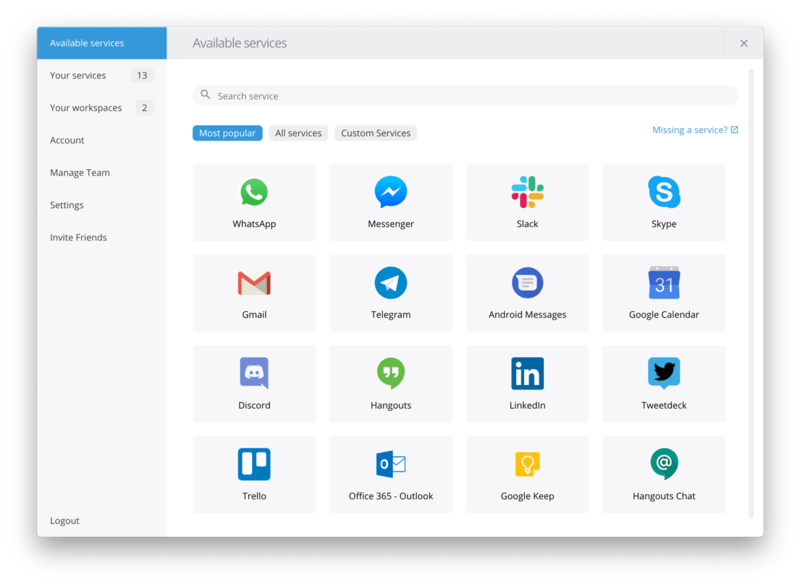 Franz supports a great variety of business and private messaging & chat services like Slack, WhatsApp, WeChat, Messenger, Telegram, Google Hangouts, Skype, Zendesk and many more. It does not matter if you just want to keep in touch with your friends or are managing a multi-seat customer care team. Franz got you covered. 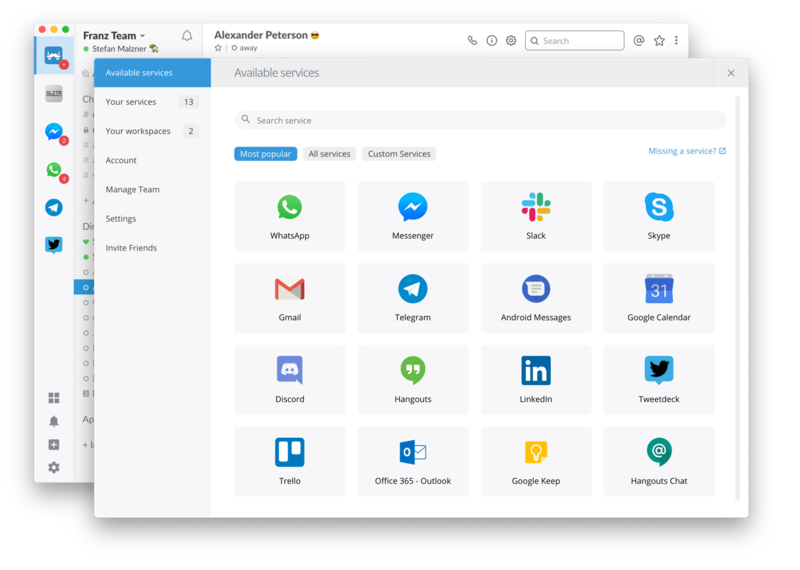 You need your messaging setup at work, home and 42 other places and don't want to add all services again and again and again? 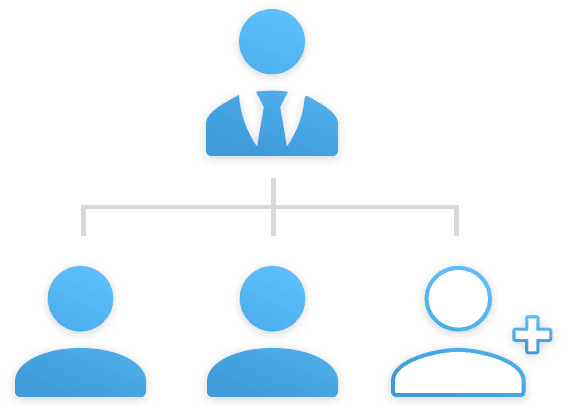 Franz 5 offers built in service synchronization. Just sign in to your Franz account on as many devices as you want and you are ready to go. Usernames and passwords will not be synchronized. You and your team use Franz? You can now manage Premium subscriptions for as many colleagues, friends or family members as you want, all from within one account. Franz for Teams gives you the option to invite co-workers to your team by sending them email invitations and manage their subscriptions in your account’s preferences. Don’t waste time setting up subscriptions for every team member individually, forget about multiple invoices and different billing cycles - one team to rule them all! The extensive plugin architecture of Franz 5 allows you add and create unlimited services to adapt Franz a 100% to your needs – not the other way around. Together with the amazing Franz community, we are constantly adding new services to offer a platform that perfectly fits your needs. Franz is truly an emperor with exceptional communication skills. He is trained in almost every major language like English, German, French, Spanish, (Brazilian) Portuguese, Russian, Japanese and many many more. The amazing Franz community helps Franz to learn new things everyday and is constantly teaching him new languages to make Franz a truly personalized experience. Add as many services as you need, it doesn’t matter if it’s 2 or 30, we got you covered. Franz will notify you about incoming messages directly in your Operating System. Here is one for the night owls. Enjoy Franz in a beautiful night mode. Control to the finest detail how you want to get notified for each service. Parlez-vous français? Franz is trained in almost every major language. Wunderbar! Set up your account in one place and enjoy Franz from wherever you want. The amazing Franz Community has created more than 1000 service integrations - just for you. Add as many instances of a service as you want. Like 5 Facebook Messengers with different accounts. No questions asked. Protect your privacy for every service individually or simply bypass government censorship. Try to write Donaudampf-schifffahrtskapitänsmütze corretly the first time. Have multiple sets of services for private-, or business communication. How do you handle my personal messages & chats? Franz does not read anything you send or receive. That's between you and your messenger service. His only interest is to successfully deliver your messages. No nosing – all hail postal secrecy! Being part of different communities often requires you to use different messaging platforms. You end up with lots of different apps and browser windows trying to stay on top of your messages and chats. Driven by that we built Franz, a one-step solution to the problem. What services are supported by Franz? Franz supports a great variety of business and private messaging & chat services like Slack, WhatsApp, WeChat, Facebook Messenger, Telegram, Google Hangouts, GroupMe, Skype just to name a few. Why is Franz called Franz? Franz, Franz, Franz, Franz, Franz, Franz, Franz... Easy to say, easy to pronounce and full of history. Franz Joseph I was the Emperor of Austria - almost 200 years later, he now shares his name with a messaging app that, just like him, is at home in the beautiful city of Vienna. First of all, we never ever ever [...] ever sell user data! 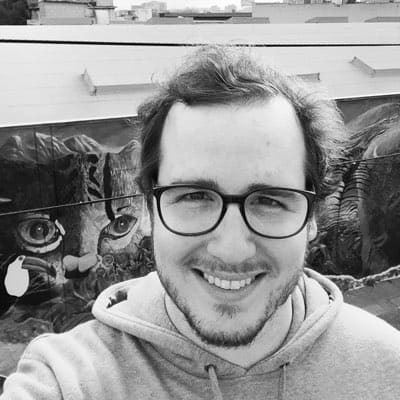 Even though Franz is a free App, you can actively decide to support our development efforts with a paid "Franz Premium Supporter Plan". To upgrade your account, you will have a few options within the app settings. Yes, finally! As of Franz 5 the source code is available on Github under the Apache 2 License. You are more than welcome to file bugs, create feature requests or support the project in general.